The Journal of African Law has been in existence for over 60 years and in that time has reflected changing trends in law and legal reform. The earlier focus on legal pluralism and customary law has evolved to include a focus on issues of international law in the African context, legal and institutional regional and sub-regional developments, post conflict resolution, constitutionalism, commercial law and environmental law. In recent years the Journal has published articles ranging from the Sharia debate in Nigeria, LGBT rights in Malawi, the new constitutional dispensation in Southern Sudan to case notes including on the rights of indigenous peoples under the African Charter on Human and Peoples’ Rights. The Journal welcomes articles on all legal issues pertaining to the African continent in its entirety. It particularly invites articles that have a regional or sub-regional, comparative or cross-cutting dimension, and which focus on major challenges and developments across the continent. 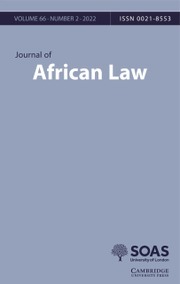 The Journal of African Law now also invites special issue or special section proposals on themes falling within its remit.